COMPACT DESIGN - The compact-designed portable Benfei HDMI to VGA adapter connects a computer, desktop, laptop, or other devices with HDMI port to a monitor, projector, HDTV, or other devices with VGA port; Tuck this lightweight gadget into your bag or pocket to do a business presentation with your laptop and projector, or extend your desktop screen to a monitor or TV; A VGA cable is required. 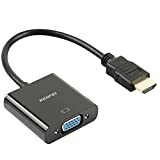 The Benfei HDMI to VGA adapter provides a cost-effective and easy solution for connecting a desktop, laptop, or other devices with HDMI port to a VGA display such as monitor, projector or TV. Connect the HDMI male end of the converter to the HDMI port of your HDMI device, and connect the VGA female end to your VGA cable from the display.